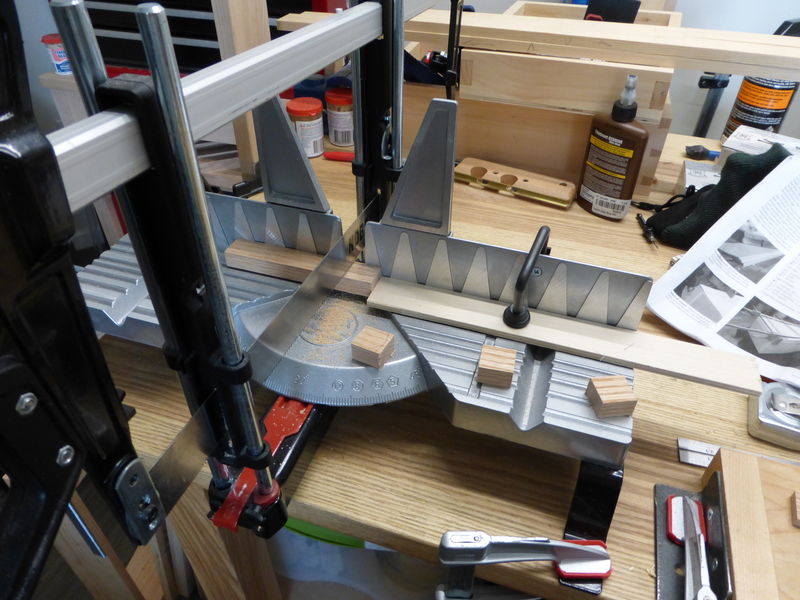 … it also works for Miter Boxes. So much of meaningful woodworking is accurate and repeatable cutting. Usually, this means knifewalls and careful crosscuts, followed by cleanup at the shooting board. But why bother with the shooting board at all when each part can be perfect right off the saw? 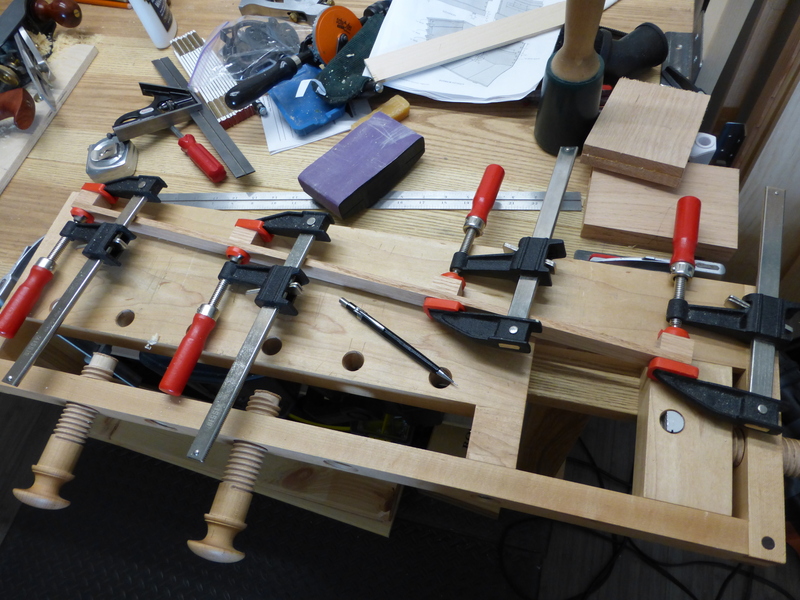 The use of a stop-block (whether at the chop saw or the miter box) ensures that each piece is identical in length, without any of that silly extra measuring. 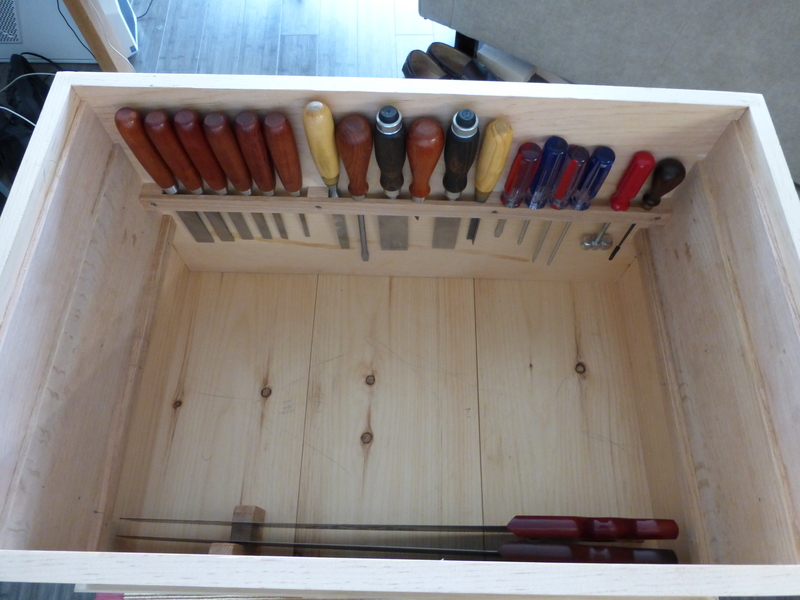 Speaking of silly, I found in my cabinet some of that no-run, no-drip PVA glue and used it to assemble the chisel rack for the medium tool chest. I swear, you only get about 45 seconds of tack time before the glue grabs, and I really don’t think you need more than 15 minutes of clamp pressure before the bond is all but permanent. Speaking of the rack, just an FYI: there isn’t a measurement for it in the plans, but I would suggest you space the bottom of the rack no more than 1.75″ from the top of the lower runner. Any higher and your chisel handles will protrude above the carcass line. I learned this the proverbial hard way. Just a test fit after adjusting the rack height. That’s the panel saw till at the bottom of the frame. Lots more to do but other responsibilities call. Hope everyone had a nice weekend!